Wine. And socks. It sounds like the beginning of a really strange party, but I promise it will all make sense soon. We all know it’s a nice gesture to get a gift for the host anytime you’re invited for a fancy get-together, but hostess gifts can often be so impersonal and thoughtless. Since most of you reading this are just like me, I’m sure you always try and make sure that your hostess gift isn’t like those others. You’re not just going to grab a bottle of wine on the way to the party, you tell yourself. So all week long, you think and think and think about what you might try to buy or craft or bake. …on the way to the party. It’s fine, really. Just make sure you also grab a pair of socks. 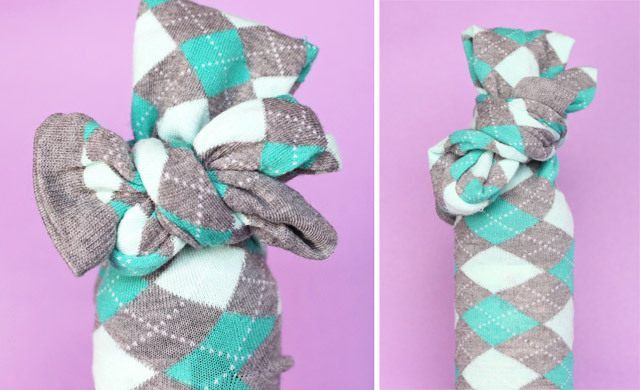 Socks are about an unconventional a hostess gift as you could ever imagine. But boy do they gussie up a hum-drum bottle of wine. Depending on the socks, you can make your gift cute or classy. Sophisticated or silly. You just have to know how to wrap it. Want to know how it’s done? It’s ridiculously easy. 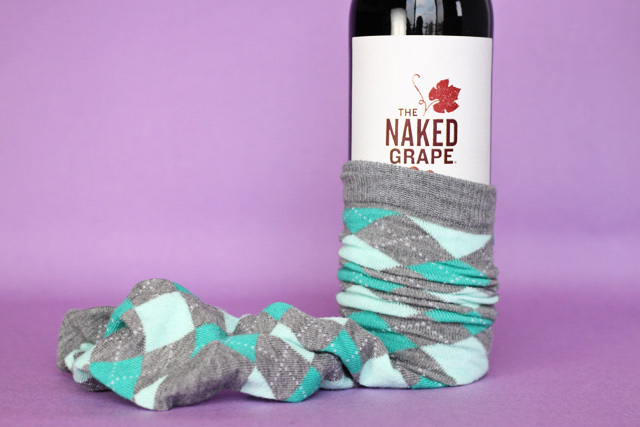 Take one of the socks and pull it all the way over the bottle of wine, starting at the bottom so the base of the bottle rests in the toe of the sock. 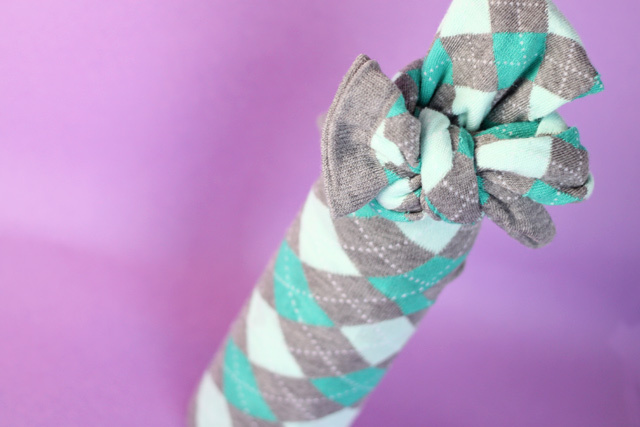 Fold the extra length of the sock back and tie the other sock around the neck of the wine bottle. Tie a knot, tie a bow. Whatever! You could even use coordinated mismatched socks if you wanted to. See? 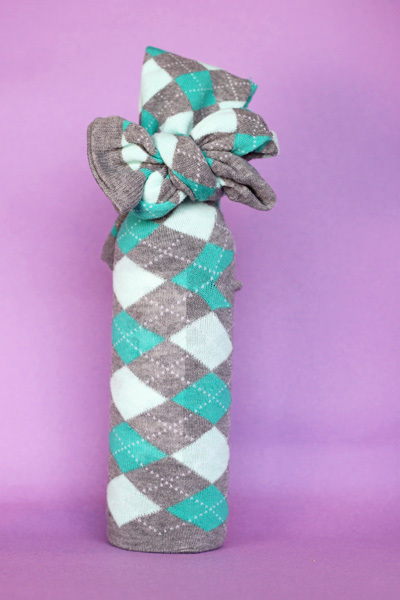 What a cute way to gift wrap a wine bottle. And this way, if anybody’s feet get cold during the party, you’re Miss Always-Prepared. Yet again! It’s not an easy job, but somebody’s got to do it. This is a great idea, you can always find these high socks on sale at the end of the winter season. Great idea! Yeah! I got this pair at Target for only $2.50. My local store has an awesome selection of very cute and colorful knee socks. This is such an awesome idea! A bottle of wine is my go to birthday gift when I don’t know a person very well, and this really personalizes it! Love it! That is CRAZY cute!! Must remember this for next time! Hi, Taryn – just saw this on Dollar Store Crafts – love it to bits!!! What a great idea! Can’t wait to do on my next wine gift! P.S. Saw this on ohcrafts.net. Such a cute idea…I have a housewarming party tonight so this is what I am taking! Thinking about adding a funky painted wine glass to the gift. Depends on the cost. But this is JUST FINE by itself. I’ll have the cutest present there. This is such a fabulous idea! Thank you for sharing this great tutorial. I wanted to let you know that I have added this project to my What Can You Make with a Pair of Socks Round Up. If you would rather I delete your project from this round up please let me know. Never thought that a wine bottle would fit in knee socks. While I find the idea a bit awkward, i think I must have to go for designer socks for wine gift. Thanks for this post! What happens to the heel of the sock? Does it bunch up in an odd place? Great idea but it is seeming too odd as well as unique. I am thinking that how these types of superb thoughts come in your mind. I will definitely try this on my birthday and want to see that what people say about it. Such a cute idea…I have a housewarming party tonight so this is what I am taking! thanks so much for great idea! What happens to the heel of the sock?